The best solution I heard was on a #assnchat Twitter Chat. We were discussing uses for QR codes and @mgallizzi suggested farmers could put them on egg cartons. The link could take you to a webcam where you could see the chickens happily pecking around a shaded farm yard. In the meantime, here's what you can glean from the labels on food. Antibiotic-Free: No antibiotics were administered to the animal during its lifetime, neither to treat nor prevent disease. Cage-Free: A cage-free hen is not necessarily a free hen running around a pasture. Often, cage-free hens are in crowded barns, with little or no access to the outdoors. They often have their beaks cut off in a practice called “debeaking,” because it cuts down on the amount of injuries when they fight each other. They may still be pumped with antibiotics and hormones. In Food Inc., they showed chickens that were "cage-free," but had received growth hormones that caused their breasts to grow so large that their legs couldn't support their weight. Free-Range or Free-Roaming: U.S. Department of Agriculture definition of these terms in its entirety: "Producers must demonstrate to the Agency that the poultry has been allowed access to the outside." In other words, there has to be a door, and it has to be open at least part of the time. The USDA has not defined the amount, duration or quality of outdoor access. Free-range chickens are typically debeaked, just like the caged kind. Grain-Fed: Animals raised on a grain diet which might have supplements in it. Grass-Fed or Pasture-Raised: Animals that graze on pasture, eating grasses and no other supplements. There have been studies that show that grass-fed animals are healthier to eat. Compared with commercial products, they offer you more "good" fats, and fewer "bad" fats. They are richer in antioxidants; including vitamins E, beta-carotene, and vitamin C. Furthermore, they do not contain traces of added hormones, antibiotics or other drugs. Organic: Birds are uncaged inside barns or warehouses, and are required to have outdoor access, but the amount, duration, and quality of outdoor access is undefined. They are fed an organic, all-vegetarian diet free of antibiotics and pesticides, as required by the U.S. Department of Agriculture's National Organic Program. Beak cutting and forced molting through starvation are permitted. Compliance is verified through third-party auditing. Obtaining the certification is expensive. Some small farms practice organic farming, but do not have the certification. Natural: A product containing no artificial ingredient or added color and is only minimally processed. Minimal processing means that the product was processed in a manner that does not fundamentally alter the product. The label must include a statement explaining the meaning of the term natural (such as "no artificial ingredients; minimally processed"). No Added Hormones: I've read that hormones are not allowed in raising hogs or poultry.Therefore, the claim "no hormones added" cannot be used on the labels of pork or poultry unless it is followed by a statement that says "Federal regulations prohibit the use of hormones." The term "no hormones administered" may be approved for use on the label of beef products. Honestly, I'm confused by this given what I saw in Food Inc. Wasn't it hormones that were given to the chickens that caused them to grow so unnaturally that their legs couldn't support their weight? Vegetarian-Fed: Cattle and poultry that have not been fed any animal by-products, supplements or additives, which are commonly used in factory farm situations. This label does not have significant relevance to the animals' living conditions. I'm sure there's much more that could be said about these and other labels, so please chime in. And, if someone can explain the whole added hormone thing to me that would be great. 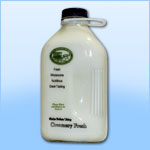 For my family, I just placed my first South Mountain Creamery order for dairy and meat. The products are not organic, but they seem to be trying to do things right and milk just tastes better from an old fashioned glass jar.